Choose from a variety of speks to display your vital health information at a glance. Manage all personal, emergency, insurance, family and caregiver information. Track your medications, conditions, family history, allergies, imaging and more. 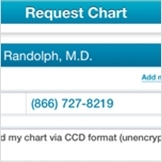 Request and receive communications and medical records from your healthcare providers. Doctors can have 24/7 access to your entire health record when you provide your Healthspek access code. The Healthspek product is constantly evolving — we continue to incorporate user feedback to implement new features and functionality to make the iPad app and mobile website precisely suited to your individual needs. This means the power is in your hands. You can now request your doctor to send your chart electronically to your Healthspek record. That means you can manage all of the information you input yourself, as well as information sent from your doctors. It drives home the idea that you own your chart. 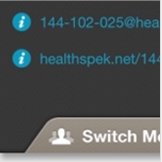 You now have a unique Healthspek email address, as well as a unique Healthspek upload webpage. Both of these addresses can be given to doctors, lab companies, and other external recourse so that they can send (or upload) documents directly to your Healthspek record. Users can now upload living wills, powers of attorney and other legal documents into the Healthspek record, allowing for a secure and easily accessible solution for those who may need to view it. Though this can be a revolutionary resource for anyone, it holds special significance for those with chronic medical conditions, as well as those serving in a caretaker role for aging relatives. Maintain your personal and family health records in an easy-to-use iPad application. Healthspek offers a wide range of personal tools and services to users, from healthcare information organizations and disease management outlets to personal reminders to refill prescriptions, attend medical appointments and more. It’s through these resources that Healthspek is able to provide users a thorough personal and family health record, and it’s this emphasis on the importance of taking care of your personal health that has influenced Healthspek to partner with Community Health Charities, a national program that connects employees in the workplace with trusted health charities. Awhile back, we wrote a blog post about Healthspek's medication management features to share the various ways your personal electronic health record can help you track and manage multiple medications. We're offering a unique take on this year’s gift giving: purchase a Healthspek pharmacogenetic test (PGT) at a discount this Cyber Monday, November 30. Healthspek is an award-winning personal health management platform that provides patients with relevant tools and services to help them take control of personal health information. By setting up a free account with Healthspek, users have access to everything from a personal electronic health record and medication management resources to a legal documents repository, an insurance agent finder and more. November is National Caregivers Month, a time dedicated to recognizing the 90 million Americans who dedicate themselves wholly to the care of another. This Thanksgiving, take a moment to appreciate these children, grandchildren, spouses, siblings, neighbors and friends who take on the responsibility of providing for and protecting those that can no longer do so for themselves. The stresses that come with this responsibility include the everyday struggle of having to take care of another individual, and oftentimes constant worry about the loved one in their care. What medications work best for you? Only your genes can tell.